They say, and we all know that most things are fine in moderation. Well, this simple principle wasn’t something I was raised with, so to this day it’s been a challenge to get it through my thick head and into daily practice. I, unfortunately, love sweets, but far too much. With this realized, in the last 6-8 months I have cut back on my sugar intake drastically. That family I was living with in Australia had an awesome sense of good nutrition and was kind enough to help me ween my sugar addiction. No longer living there, I’m faced with putting the self in self-control and force myself to stay on track and avoid send my blood sugar levels soaring. Needless to say, my eyes are constantly on the roam for healthy sweet treats. The good news is that there are a ton of great blogs and cookbooks that document healthier dessert/snack options, one of my favorites being Heidi Swanson’s 101 Cookbooks. 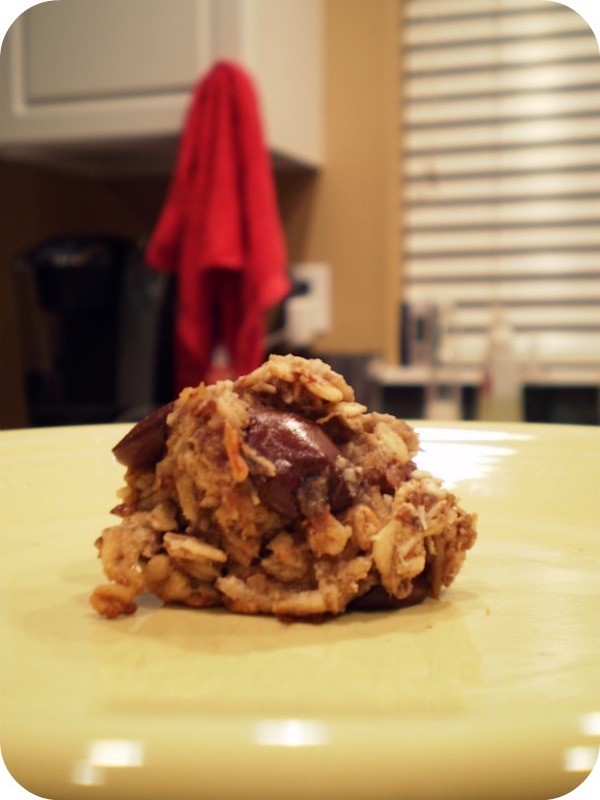 When my pops requested I bake something for a meeting with his colleagues, I turned to Heidi’s blog and found a magical little cookie recipe that was a total crowd pleaser. Preheat oven to 350 degrees, racks in the top third (mine was on the secon. In a large bowl combine the mashed bananas, vanilla extract, and coconut oil. Set aside. In another bowl whisk together the oats, almond meal, shredded coconut, cinnamon, salt, and baking powder. Add the dry ingredients to the wet ingredients and stir until combined. Fold in the chocolate chunks/chips.The dough is a bit looser than a standard cookie dough, don’t worry about it. Drop dollops of the dough, each about 2 tsp in size (you can choose to make these smaller, for a truly healthy bite-sized snack), an inch apart, onto a parchment (or Silpat) lined baking sheet. Don’t worry too much about how far apart they are, as they won’t spread or melt. Bake for 12 – 14 minutes. Heidi/Nikki’s cooked for nearly 15 minutes, mine were perfect at 13, so keep a close eye on them after 12 minutes on. Recipe Cookies/Bars, Dessert, Recipes, Snacks, Vegan. permalink.